Fatimah al-Ma'sūmah Shrine, Qom, Iran. Fātimah bint Mūsā al-Kādhim (Arabic: فاطمة بنت موسى الكاظم‎‎), commonly known as Fātimah al-Ma‘sūmah (Arabic: فاطمة المعصومة‎‎) or Fatemeh Ma'sumeh (Persian: فاطمه معصومه‎‎, "Fatimah the Innocent"), Masuma-e-Qum (معصومه قم), and Hadrat Masumah (1st Dhul Qi‘dah 173 AH – 10th or 12th of Rabī’ al-Thānī 201 AH; approximately March 22, 790 AD – November 7 or 9, 816 AD), was the daughter of the seventh Twelver Shī‘ah Imām, Mūsā' al-Kādhim and sister of the eighth Twelver Shī‘ah Imām, ‘Ali ar-Ridhā. Every year, thousands of Shi'i Muslims travel to Qom to honor Fatima Masumeh at her shrine and ask her for blessings. Despite having been infallible, Fatima Masumeh is not considered one of the 14 most holy figures in Shia Islam. Yet, her brother Imam Ali al-Ridha gave her the title "Masumeh", which means infallible or sinless. In Shi'ism, women either become saints by their own accord or because they are the sisters, daughters, or wives of other saints. Fatima Masumeh became a saint because of her closeness to her brother Imam 'Ali al-Rida and her father Imam Musa al-Kadhim. However, Fatima Masumeh also has her own reputation of holiness and wisdom. 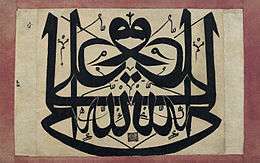 She is said to have been learned in various Islamic sciences and the teachings of Muhammad, and to have transmitted many hadiths from her family members. Fatima Masumeh is honored in many hadiths, or teachings, from Shi'i Imams that proclaim the benevolence of visiting her shrine in Qom. Her brother Imam 'Ali al-Rida stated that visiting the shrine of Fatima Masumeh is equal to visiting him, demonstrating his honor of his sister. Other Imams declare that anyone who visits Fatima Masumeh's shrine will surely go to heaven. 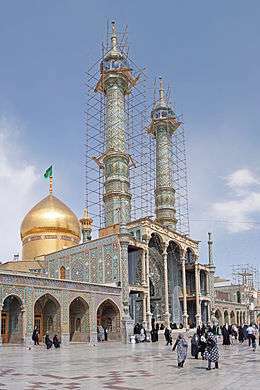 More miracles are reported to occur at her shrine in Qom than at the burial place of any other prophet or imam. It is written that even before she was born, Shi'i Imams foretold Fatima Masumeh's holiness and piety. Fatima was born into Shi'i legacy, raised under the care of two Imams - her father and her brother - and she is said to have absorbed their knowledge and holiness. Fatima Masumeh was born in Medina in 173 AH and spent the first six years of her life learning alongside her father, Imam Musa al-Kadhim. Scholars have written that she had a "special giftedness" of knowledge and spiritual awareness, even in childhood. When she was ten years old, Harun al-Rashid, the 5th caliph of the Abbasid Caliphate sent her father to prison. This separation was very difficult for Fatima, but her brother 'Ali was 25 years her senior and took care of her. 'Ali and Fatima are among Imam Musa al-Kadhim's 37 children, but they are the only two children from the Imam's marriage to Najmah Khatun. Their mother was a former slave from North Africa who became very learned in Islamic teachings under the guidance of Imam Musa al-Kadim's mother, Lady Hamidah. Ali would later become the 8th Imam and gain the title Imam 'Ali al-Rida. The historian al-Tabari states that 'Al-Rida' means "The One Well-pleasing [to God] from the House of Muhammad." He was appointed successor to the Abassid Caliph al-Mamun, though he was hesitant in accepting this role. As 'Ali al-Rida gained the title of "Crowned Prince" , some people refused to accept his role amidst civil war. 'Ali al-Rida revealed the extent of this revolt to al-Mamun, stating that people considered him(al-mamun) "bewitched and mentally deranged," were hiding reports from him, and had given their allegiance to his paternal uncle Ibrahim bint al-Madhi instead of him. In 200 AH, al-Mamun called for 'Ali al-Rida to leave for Khorasan and Fatima Masumeh was forced to live apart from her brother. After one difficult year apart from her brother, Fatima Masumeh decided to leave to join him. She did not leave solely because she longed to live near her brother; scholars also suggest that Fatima Masumeh's knowledge and religiosity would help her brother in his political office, especially in decisions regarding women. In 201 AH she set off in a caravan of 23 family and friends of the Imam 'Ali al-Rida, alongside another caravan of 12,000 people traveling to Khorasan. Unfortunately, the caravans never made it to Khorasan and Fatima Masumeh never reached her brother. They were attacked by enemies of the Shi'is while at Saveh; some fled, but many were wounded, taken prisoner, or killed. Fatima Masumeh survived, but was forced to watch the murders of 23 close family members and friends. It is written that Fatima Masumeh was then poisoned by a woman from the enemies. Fatima became ill and asked to be taken to Qom, where she died and was buried in her host's land. ↑ Jaffer, Masuma (2003). "1". Lady Fatima Masuma (a) of Qum Masuma Jaffer. Qom: Jami‘at al-Zahra. ISBN 964-438-455-5. 1 2 3 4 5 6 7 8 9 10 11 12 13 14 Jaffer, Masuma (2003). Lady Fatima Masuma (a) of Qom. Qum: Jami'at al-Zahra: Islamic Seminary for Women. ↑ Mernissi, Fatima. "Women, Saints, and Sanctuaries in Morocco". In Nancy Auer Faulk and Rita M. Gross. Unspoken Worlds: Women's Religious Lives (3 ed.). Canada. pp. 144–153. 1 2 3 Tabari (1987). Translated by C.E. Bosworth, ed. The History of al-Tabari: The Reunification of the 'Abassid Caliphate: Vol. 32. New York: SUNY. ↑ Lewis, B. "Ali al-Rida". Encyclopedia of Islam, Second Edition. BrillOnline Reference Works. ↑ Canby, Sheila R. (2009). Shah 'Abbas: The Remaking of Iran. London: The British Museum Press. Zohreh Sadeghi: Fāṭima von Qum: Ein Beispiel für die Verehrung heiliger Frauen im Volksglauben der Zwölfer-Schia. K.Schwarz Verlag, Berlin 1996, ISBN 978-3-87997255-5.